By re-presenting a safe which has been broken into as a sculptural work of art, Maurizio Cattelan has taken the idea of the ‘Readymade’ one stage further, by cleverly highlighting the criminal nature of this activity as outright theft. 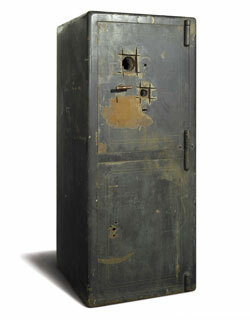 '-76.000.000' is a real broken safe from which 76 million lire was stolen. In the broken safe, Maurizio Cattelan has ingeniously discovered a metaphor for the bankruptcy of ideas in post-modern communication, or what Roland Barthes termed “The Death of the Author”. As an artist burdened with the rich history which comes before him, Maurizio Cattelan is constantly needing to break into the historical locker for inspiration.